When German relatives know you’re coming, the red carpet not only gets rolled out, it gets wrapped around you. 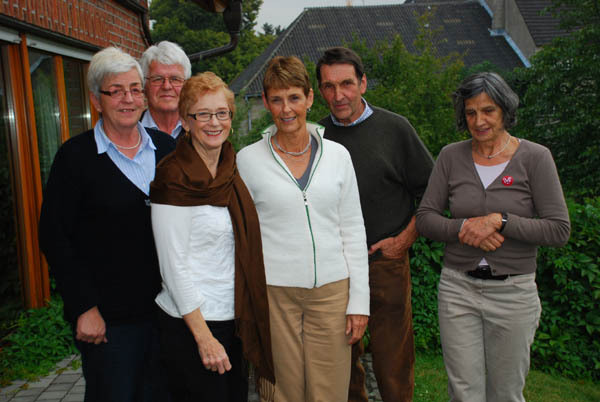 Suzanne Pellegrino and her sister Beth Renney not only gave their relatives in tiny Hoinkhausen, Germany advance notice, they gave them nearly a year to get prepared. And boy oh boy, were the relatives prepared! When we showed up at 10:30 sharp (like good Germans, we made sure that we were exactly on time. Germans have a huge respect for time and being “fashionably late” is never an option) the house was ready and so was the Mollerus family. 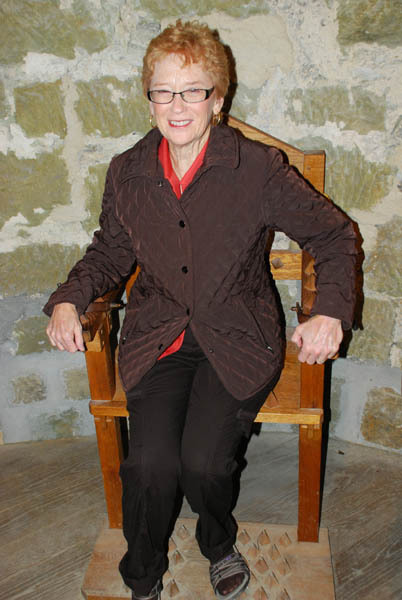 We were greeted warmly at the front door of the farmhouse, built in 1912, by Wilma Mollerus. Her husband Englebert (Bert) was waiting in the small living room off the hallway. We were seated and immediately joined by their daughter with her newborn baby. Sparkling wine was poured and we all had a “zum Wohl” (to your health) toast. Soon other relatives showed up. 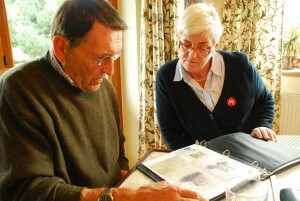 Bert’s sister Monika and her husband Andreas had driven in from Hagen, an hour away. Sister Beate was there from the neighboring village of Oestereiden, he husband Ferdinand joining us later for lunch. After our toast, we walked across the street to the village church. The “honorary Mayor” of nearby Ruethen, Rolf Brotbeck had joined us. He explained, in flawless English, the history of the church and even played the organ, installed in 1750. He played two songs, obviously struggling a bit to work his way through the first parts of each on an unfamiliar instrument, carefully pulling out the stops to the right positions before he began. It was a special performance and we appreciated it. After our tour of the ancestral church we continued to the schoolhouse. The little house was built in 1803 by the local priest, Father Herold, who had served from 1780 to 1810. The school was special in that girls were also offered an education here, unusual for the times. Nowadays the little house is used for church socials and coffees. Where a large oven used to stand there is now a sink and counter. Rolf told us that kids had to each bring a piece of wood to school in order to heat the structure. 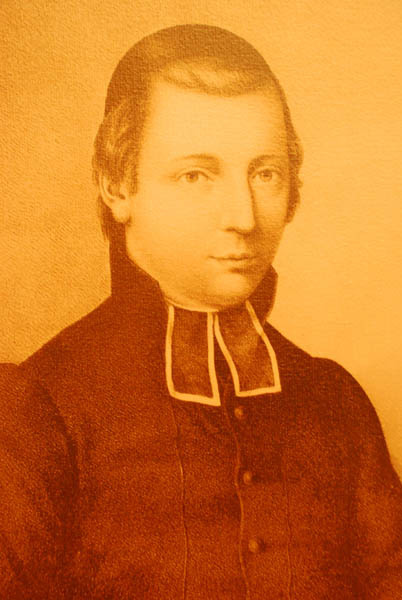 Father Herold, who insisted that girls be educated in the school that he built. He served Hoinkhausen’s farmers and families from 1780-1810. We walked next to the former priest’s house, now used as a religious retreat for youth groups from the surrounding region. There are 34 beds in the large half-timbered house. A massive fireplace at the rear of the house near the large kitchen provides the heat. 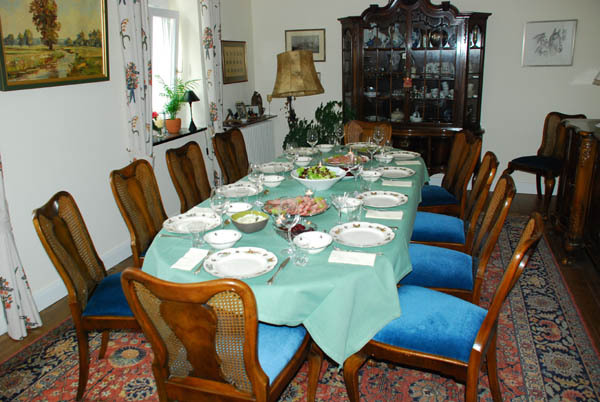 The dining room at the Mollerus home in Hoinkhausen. Mollerus families have lived on this farm since 1794. First of two desserts – yum! We wandered back to the Mollerus farm where Wilma was busy setting out lunch. And what a lunch! We had thinly-sliced roast beef, two big platters full. 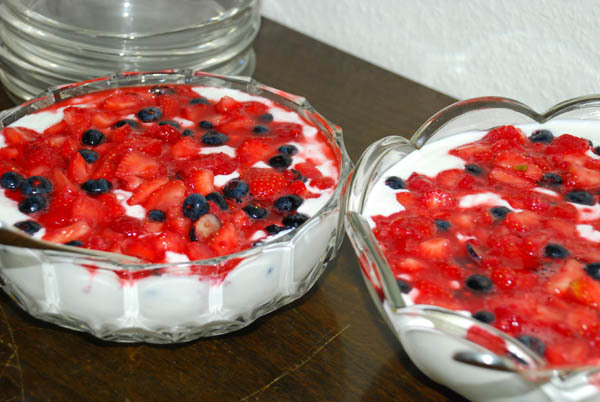 Young potatoes and sour cream, two different kinds of beets and not just one but two desserts, including a joghurt bowl with fresh berries and a homemade plum cake brought by Monika. Coffee or tea was served afterwards. Following this banquet, we drove in several vehicles to Ruethen where Rolf provided a nearly two hour long walking tour of the old town’s important landmarks. 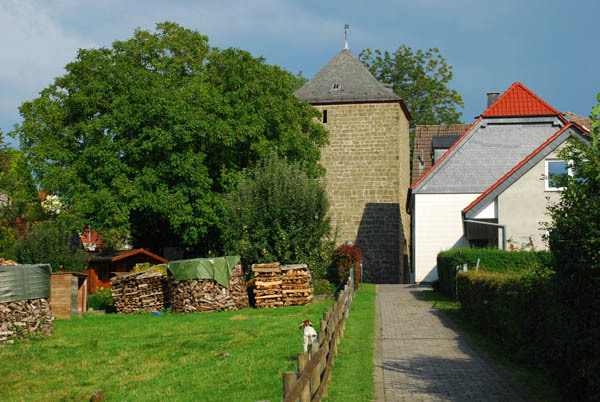 Ruethen was once a walled town with more than a dozen watchtowers. When the Bishop of Cologne wanted to show the Bishop of Paderborn who was in charge, he fortified the little hilltop village of Ruethen. It was every bit as impressive as Rothenburg ob der Tauber, in Bavaria. (One of Germany’s most famous walled towns) When Napolean took over this part of Europe in the early 1800s, the wall was ordered dismantled. Only small sections remain and two towers. We saw the former Cistercian monastery, now converted to apartments. We saw the rope-making house near the former “Witches Tower,” once used for torture. Reproductions of torture instruments are shown, including a chair with wooden spikes. We all got to try that one out, if only for a few seconds. 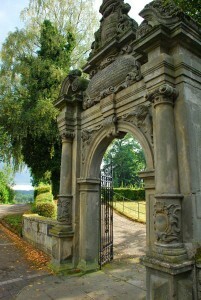 Following the rim of the old wall we soon came to the cemetery, which occupies the place of the former castle. The castle was the last refuge for the villagers in case of attack. Wells could provide enough water for all, and those wells are still used today to water the flowers on the graves there. A funeral had just taken place and workers were filling in the grave. In Germany, one only has the use of a grave for about 35 years. After that, the family has the option to pay for the grave again, or give it up. Most people give it up. Bodies are not buried in metal caskets, but rather, wood. And, no impenetrable vault. After 35 years, there is nothing more than bits of bone and fittings from the coffin left. Those items are respectfully dealt with, and the new occupant goes into the grave space. This is necessary in a country the size of Arizona with 88 million living inhabitants. We continued our walk to the remaining town gate, one of four which once admitted residents and visitors into the protected town. There in the ditch is the Jewish cemetery. It is a protected site maintained by the town. Rolf told us the story of the Jewish butcher who had a loyal following. During the Nazi era, a spy would watch the comings and goings into that butcher shop from the window of the town hall across the street. Crafty farmers would park their wagons in such a way as to hide the identities of those who came and went. The butcher was respected in this area because he always paid a fair price for the meat he purchased from local farmers. He shot himself in 1941 rather than be taken to a concentration camp. 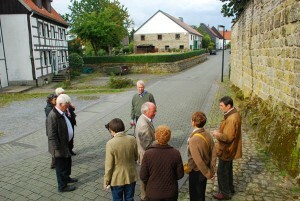 Our walk around Ruethen ended back where it had began, at the modern town hall. Our first day visiting with the relatives had ended. The schedule for the following day was briefly discussed, and we said our “Auf Wiedersehens” until tomorrow. The red carpet will still be there when we come back again at 10:30. Sharp. Posted in Family History Tours and tagged family, genealogy, germany, history, hoinkhausen, research, ruethen, tours, trips.